Today’s clean air requirements are more critical than ever. Air tools, blow driers, HVLP spray guns, and supplied air respirators may require more air volume and better air quality than needed in the past. Not only does clean air effect equipment performance, but it is also critical for paint coatings performance. Dan-Am Air’s aluminum airlines along with the technology of SATA’s filtration system can solve all of these issues. The Dan-Am Air system is reusable and easily adaptable to any space, not only ensuring safe, clean air for your team, but also increasing your shop’s efficiency and improving your business’s bottom line. SATA filtration is available in two sizes, which can flow up to 129 cfm at 90psi—an exceptional amount of air for a single filtration unit, Gravenhof says, enough to accommodate multiple booths on a single filter. “If your shop is equipped with multiple booths, you have the option of a single SATA filter to maintain, as opposed to a filtration unit at each booth. Fewer filter cartridges to maintain equals fewer dollars spent,” Gravenhof says. The SATA three-stage filtration system is simple: The first stage is the water separator, removing the larger moisture droplets and particles down to 5 microns from the air; next is the fine filter which removes particles down to 0.01 micron; and, finally, there is the activated charcoal filter stage removing hydrocarbons, oil vapors and odors to give you perfectly clean air for breathing and spraying. Following that process along with changing your filters as recommended, and with no CO detected, the filter provides Grade D breathable air. The system’s airlines are made of powder-coated, aircraft-grade, extruded aluminum. Aluminum’s biggest advantage? Easy to install, modular and reusable, lightweight, corrosion resistant, and guaranteed not to leak. 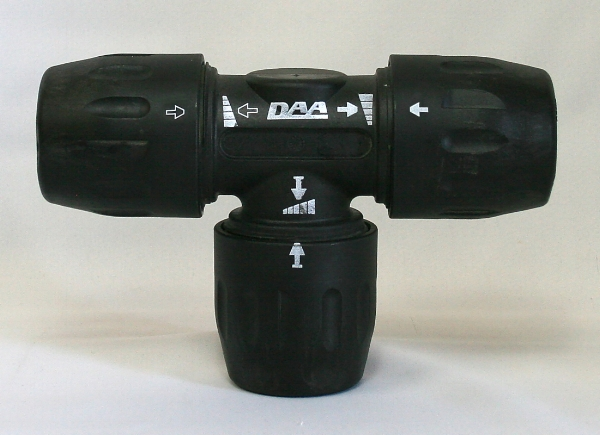 Dan-Am Air fittings are constructed of a reinforced Nylon composite material, with a double Nitrile seal. The manifolds and ball valves are nickel plated solid brass, and all threaded connectors are high grade steel. Dan-Am Air can be easily adapted to your current system with the variety of threaded connection options available. Designed with simplicity in mind, DAA allows you to do-it-yourself. Measure, cut, de-burr, then simply “Press-to-Connect”. The direct result being lower installation times and costs. All fittings arrive pre-torqued for immediate assembly and pressurization, as well as being interchangeable, allowing for ease of future addition or expansion. The “Press-to-Connect” subject tends to be the most misunderstood instruction in the DAA system. We have all been taught since we were young to first loosen a given item, put it together, and then tighten it. That is NOT the recommended installation procedure for DAA fittings. DO NOT loosen fitting caps before installation. It’s as simple as pushing the fitting onto the pipe until it is fully inserted. The only reason to loosen any given fitting cap would be to remove the fitting from the pipe. If a fitting cap is loosened and removed, simply re-torque the fitting cap to factory specs (line up the arrows) and press-to-connect. As each cap is individual to its fittings, the torque range arrows are either solid or hollow, and specific to their fitting and fitting placement. Fitting caps are not interchangeable. With high air volume demands and efficiency requirements, many of the major paint company training centers across the US utilize the benefits of DanAm Air and SATA Filtration in their facilities. The airlines, and fittings, have what Gravenhof refers to as a “smooth, full-bore” design, where there are no restrictions. The air flows easily and quickly through with no leaks or contaminations. “More than anything, it’s going to be one less thing to focus your time on, allowing you to concentrate on other aspects of your business.” Gravenhof says.